Getting a tattoo can be a major milestone for some people, but according to a new advice from the government, many may come to regret the ink and try to get it removed. According to the American Society for Dermatological Surgery (ASDS), almost 100,000 tattoo removal procedures were performed in 2011 -- a vast increase from the 80,000 that took place in 2010. It may be because 21 percent of American adults are now tattooed, a Harris Interactive survey conducted in January 2012 reports. The number has increased from 16 and 14 percent since Harris Interactive last polled people in 2003 and 2008 respectively. The Food and Drug Administration issued a Consumer Update on Jan. 30 reminding people that the FDA regulates the inks in tattoos -- which the agency considers to be a cosmetic -- as well as the laser devices used to remove them. Several types of lasers have been okayed as "light-based, prescription devices" approved for tattoo removal. In addition, Cynosure's PicoSure was approved for marketing as a laser work station for tattoo removal. 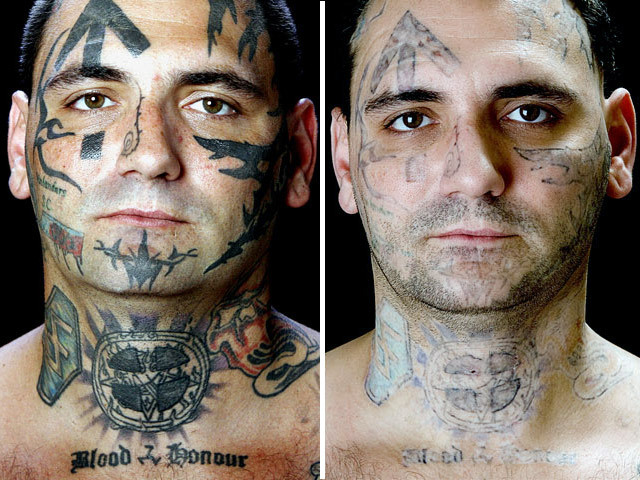 "In the old days tattoos used to be black," Dr. Michele Green, dermatologist at Lenox Hill Hospital in New York, told CBSNews.com. "Now there's oranges and purples -- other colors are much harder to remove." Green, who performs tattoo removals for her patients, said the number one reason she hears from people who want a tattoo removed is that they change their mind when they get older. About one in eight people who have a tattoo said they regretted getting it, according to the Harris Survey. Green said she sees about 20 patients a month who want their permanent ink removed. What makes tattoo removal so difficult, Green explained, is that multiple lasers are required to remove the various colors. Each color requires a different wavelength, which means different lasers might need to be used. Traditionally, blue and black colors are the easiest to remove, and other shades are harder for the light to get rid of. Size can also play a big role. The larger the tattoo, the more time it would take. "If you drew a really, really dark line with a pencil and you drew it really, really heavy, you'd have to erase it again and again (to get rid of it)," she explained. "What if you drew a large circle? It takes longer to erase something larger." Not only is tattoo removal a time consuming process, it can be quite costly. Green said prices range from $400 and up for each laser session depending on size and colors. It takes at least five treatments just to remove a simple black tattoo the size of a quarter, and more complex tattoos can take 10 or more sessions. There's also a waiting period of six to eight weeks between each laser removal appointment to let the skin heal, so if you want a tattoo gone right away, Green said it's not going to happen. However, the myth that tattoo removal is painful isn't always true. FDA's Mehmet Kosoglu, who reviews applications for marketing clearances of laser-devices, said in the FDA's report that it really depends on the patient's pain threshold. Green pointed out that her patients receive numbing creams and lidocaine shots to relieve discomfort. Then, there's always the possibility that your tattoo won't completely be erased. "Complete removal, with no scarring, is sometimes not possible," Kosoglu said. Green suggested that if you want to get a tattoo removed, make sure you go to a board-certified dermatologist who is using an FDA-approved laser and device for tattoo removal. She warned that there are many people out there -- including other dermatologists -- that may attempt to use non-approved ways to remove tattoos. Do-it-yourself tattoo removal ointments and creams are available, but the FDA cautioned that since they haven't been tested, the products may cause reactions like rashes, burning, scarring or changes in skin pigmentation. A colleague of Green's admitted that they had their tattoo removed using dermabrasion, which essentially "sanded her skin and left her with a huge scar." She's also heard of people cutting out the tattoo. "To me that's malpractice unless someone says to you I want to cut it out," she said.